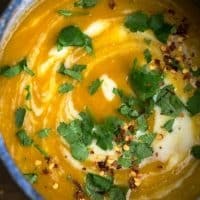 Miso Butternut Squash Soup with Millet Cream | Naturally. There is nothing more satisfying than cracking open a new cookbook and feeling overly inspired. It’s not an easy feat because repeating the wheel in plant-based cooking happens a lot. 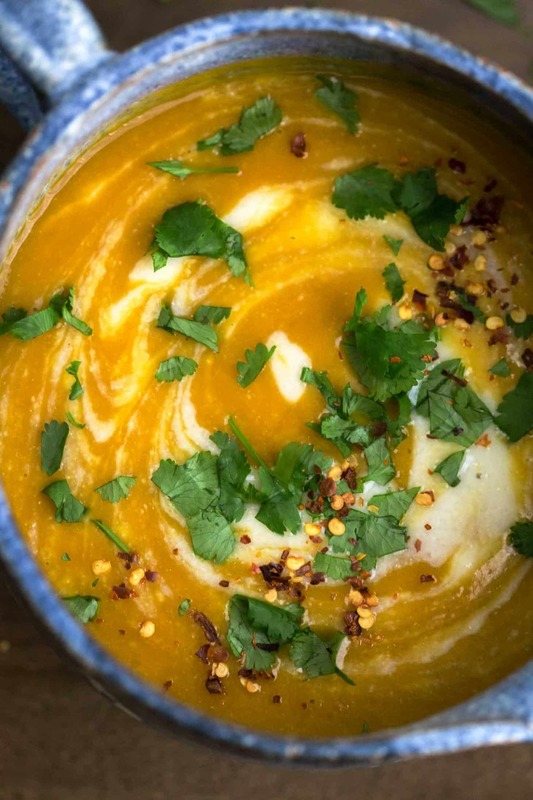 I love this miso butternut squash soup because of the hidden creaminess, made from millet. In the cookbook Everyday Whole Grains, the author makes a cream out of millet or brown rice. It was like a lightbulb when I hit that page (among other ideas like smoking and pickling grains). I’ve made my fair share of nut and seed creams and the idea of millet cream really intrigued me. I have a love affair with millet from turning it into polenta to making grain cakes out of slightly overcooked millet. It’s such a versatile pseudo-grain! 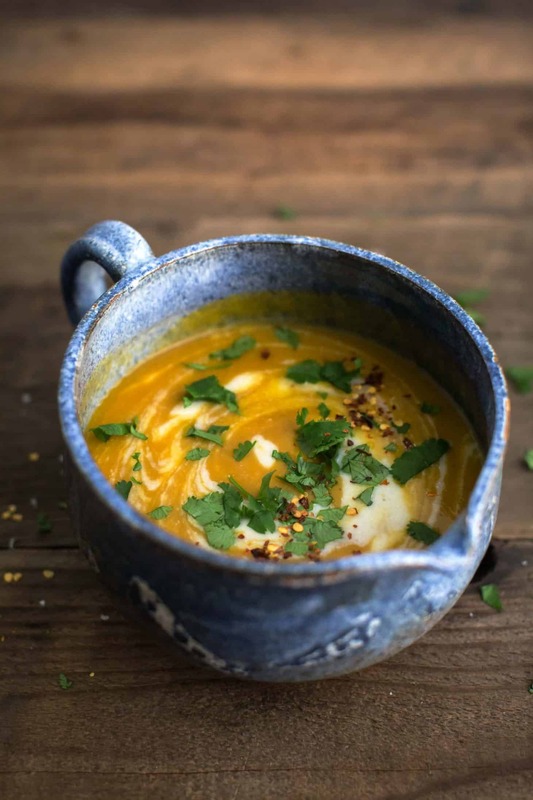 An easy take on traditional squash soup, this miso butternut squash soup has a solid depth of flavor with help from brown rice miso and roasted garlic. Heat oven to 400˚F. Slice the top off the head of garlic so that the cloves are exposed. Drizzle with olive oil, salt, and pepper then wrap the clove in parchment. Roast until the garlic is tender, 40 minutes or so. In a square of parchment, Slice the butternut squash in half and place cut-side down in a roasting pan. Pour ¼” of water in the bottom of the pan and roast the squash until tender, 30 minutes or so. 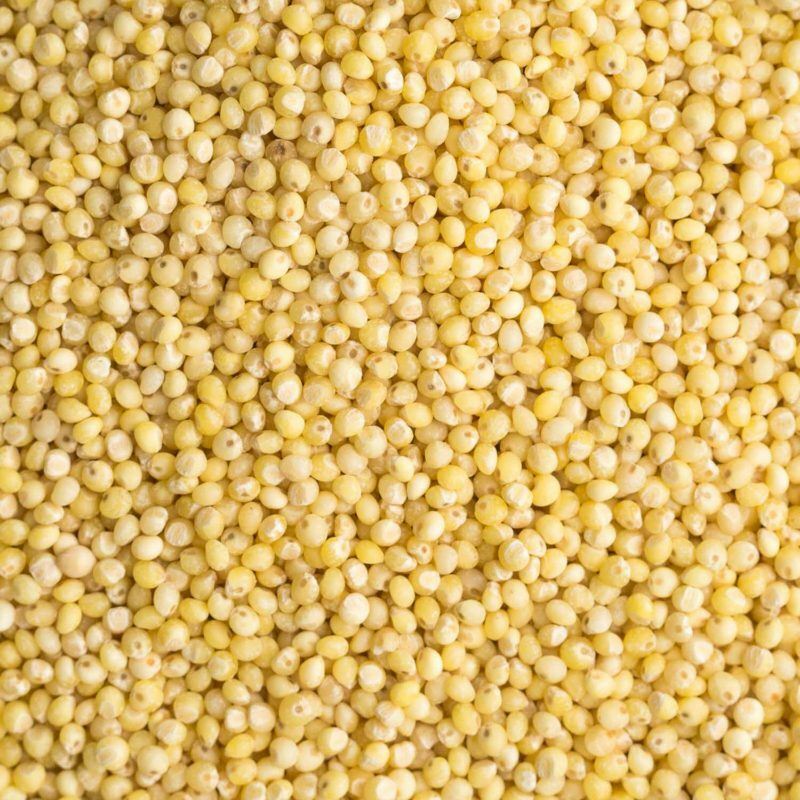 In a small pot, combine the millet and water. Bring to a boil, reduce to a simmer, cover, and cook until the millet is overly soft, 30 minutes. There should still be liquid leftover. Place the millet and liquid in a blender and puree until smooth, adding more water, around 1/2 cup or so, to reach the consistency close to cream. Transfer to a bowl and set aside. When the squash and garlic is done, measure out 2 cups of the squash and 5 to 6 cloves of the roasted garlic. Save the remaining squash and garlic for later use. Place the squash, garlic, ginger, and rice vinegar in a blender. Add 2 cups of vegetable broth and puree until smooth. Add more vegetable broth as needed to thin out the soup. Place the soup in a pot and bring to a simmer. Add ½ cup of the millet cream and continue to cook the soup until hot. Stir in the miso before serving, taste, and adjust seasoning as desired. Serve soup with a drizzle of millet cream and sprinkle of cilantro/chili flakes. Tips & Tricks: The millet cream will thicken as it sits. Loosen with more water as needed. Store extra cream in the refrigerator for a few days to use in sauces and soups. Link: The millet cream is a recipe from the book Everyday Whole Grains. The author calls for adding milk, instead of the water, before pureeing. You could do this with almond or coconut milk. One of the most important parts of this recipe is to not overcook the soup once the miso is added. Miso is fermented and when cooked, you lose goodness from the fermentation. I recommend that if you plan on storing this soup, portion out the amount you want to save then add the miso to the rest. This way you can reheat the leftovers and add the miso before eating. Cream: I like the bulk of the whole grains in the cream (plus it’s just a fun use of grains). However you could easily use regular cream or a cashew/sesame cream to keep it vegan. I occasionally will even do a small dollop of tahini. 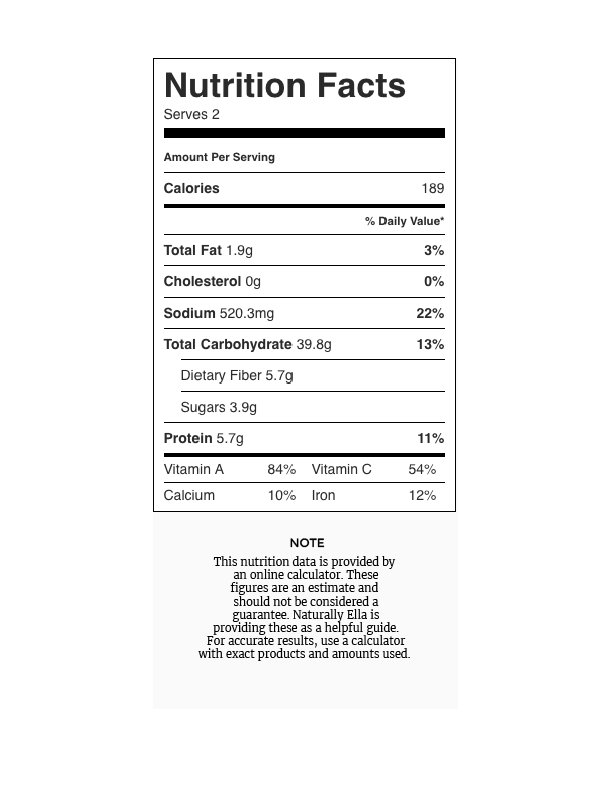 Miso: This is the predominant flavor in the recipe but you could leave it out. I’d recommend adding a splash of soy sauce but if not that, a pinch of salt. I love the depth of the dark miso, which is why I only use a couple teaspoons. If you can only find light miso, I recommend adding another teaspoon or two. Boiling instead of roasting: Don’t want to wait for the squash and garlic to roast? Saute a couple cloves of minced garlic in oil and peel/cube the squash. Place in the stock pot, add the broth and cook until the squash is tender. Vegetables: Swap out the butternut squash for sweet potatoes or a different winter squash like acorn or kabocha squash. Love the idea of this! I don’t use millet very often, but would love to experiment more. This looks perfect!